In the Law of the Pack, a cub scout gives good will and in the Boy Scout Promise, a boy scout promises to help other people at all times. By participating in a Scouting for Food program, scouts come a step closer to fulfilling those words. Across the country, in many councils and districts, thousands of troops and packs with millions of scouts involved collect tens of millions of pounds of food which is distributed to needy neighbors. 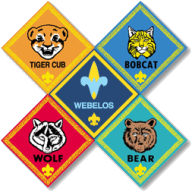 Pack 36 has a strong history of participation in the program.